I like programs that detect the need for software updates. Installation was easy, and the interface is simple and to the point. I would like to choose between an auto-update and a manual update – SUMo only offers a manual update. I have one concern – it detected the need to update itself, so if I do this does it void the license received via SoS? While it did identify a lot more programs that needed update compared to similar products, it lacks the ability to automatically update them. Which is a huge minus for me. I don’t wanna manually update every single program. Im a Big Fan of Software Updaters especially where they give you total control. This one is by far THE BEST for advanced computer users. It has the highest software detection rate of installed software. Doesn’t scan Microsoft software as these are updated via Windows update, but does gives you the option to include. Provides a Google custom link to search for the identified updates which is no problem really. Just an extra step. The paid Pro version downloads the updates automatically if you need this. However its better to use Secunia PSI 3 (Its free) if you prefer an automated software update process without the need to capture the update file. SUMo can save you a bit of time in identifying programs with available updates. Unfortunately it is unable to distinguish between stable and beta releases, from one upgrade to the next. Every single reported update requires manual investigation. Unless you actually want beta releases, then you’re looking at an avalanche of false positives. I don’t totally regret buying it, but it certainly isn’t the time saver I hoped it would be. This software is good, but it requires improvements. It opens the page to download the update, but it is not direct as it leads to the other page. In addition, it can not properly evaluate the version number in some cases, however this is a problem for all similar programs. I have already tested several programs and all have flaws. One option is WebSite-Watcher, whose evaluation process is a bit different. If you live in an area that has extensive internet connection, one of the things that will cause you little worry is software updates. However, when using a limited internet connection, you will definitely be aware of the usage. Instead of letting program auto-update themselves before you know it, I found a software that can be handy. SUMo PRO will check if updates are available for programs installed and let you decide if you want to update them right away or not. Downloading and installing SUMo PRO was pretty smooth and it took me a few minutes. Based on its system requirements, the program supports both 32 and 64 bit systems for Windows Vista and later. SUMo’s interface focuses mainly on the functionality and less on any fancy layouts. However, the available options are still straightforward and easy to use. On opening Settings under Options, you will get a window with a load of options to help you choose how you want the program to work. For instance, I was able to configure the Host and Port for my HTTP proxy for the program to work. In addition, the software has a range of check boxes to let it Load at startup, Scan for new software at startup, and between Normal and In-depth scans for updates. After performing the necessary scans, SUMo PRO will display the results on its main window. 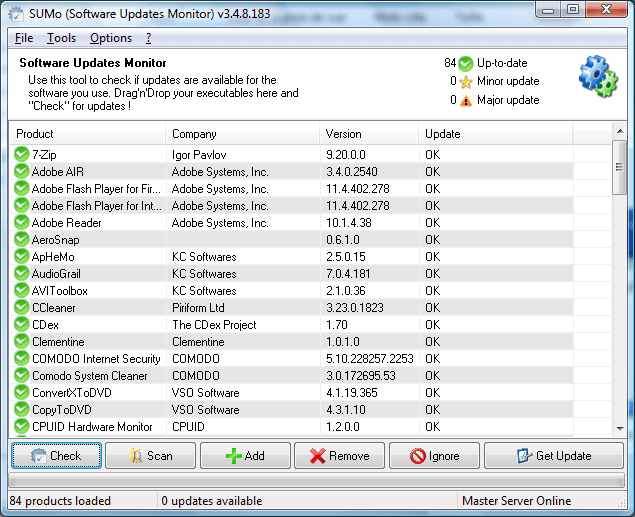 The list of results shows details of each software and if there is an update available for it. If you want to refer to the list at a later date, quickly head over to Tools and choose to export either to a Text or Spreadsheet file. Apart from hitting the Check button at the bottom left side of the main window of SUMo, which checks available updates for installed apps, you can drag and drop the executable file of a particular app to check for its update. You can also opt to use the Add button at the bottom of the interface. SUMo PRO has the Scan option. After initiating this option, it scanned for all the installed applications and listed them. However, the Update column did not show which applications were up to date and which ones required updating. It just showed me a summary of how many of the installed apps were up to date. If you are looking for an application that provides an easy way to check which of your installed programs require updating, the SUMo can be a good consideration. It runs pretty smoothly and it is easy to use despite its rather plain and less engaging interface. Keeping software in your PC up to date can be quite the nightmare. I personally use a physical approach to software that doesn’t have an automated update checker, meaning that I have to manually look for updates when I feel like. SUMo (Software Updates Monitor) promises to keep me up to date the easy way. The big question is, does it work or is it just a painful piece of junk that does nothing but get in the way? SUMo looks and feels light enough to be a bother to any system. This is my top priority in software that will be running in the background since I don’t like wasting resources for no apparent reason. The developer seemed to have taken the cue and created something light that still gets the job done mighty fine. When I first launched the app, I was greeted with a welcome wizard that is actually useful. It lets me automatically detect installed software (did this very fast, could be because my test PC had a handful of programs installed). You can run the auto test or skip to settings. If it finds software, you will have the option checking for updates at the click of a button. This will categorize your apps in up to date, minor update and major update categories. This is simple work but it is pretty neat the developer thought of putting it on the wizard. The options panel is a practical marvel. You can let the app check for updates automatically on startup and scan for software updates at the same time. You can show the path to software and limit the installation of Bata versions. You can stick to quick normal scans or stay with in-depth scans for better results. The most amazing thing about these features is that they all work. They will identify your software and tell you if there is an update or not. This is a common problem to people running on corporate networks. SUMo takes charge of this by creating a dedicated connection tunnel using the proxy and password details set in the options pane. This makes it very useful if you are monitoring or updating corporate or company computers. I expected something neat after clicking the update button. I would have loved it more if SUMo handled everything without launching my default browser and forcing me to download the latest version of the software and manually install it. It could be too much to ask for but this makes the update process very manual and is a definite deal breaker. Thank you VERY much for the real-live-person’s review that, although familiar with SUMo, DUMo and the like, I found useful and informative. As to The Vedict, your Honor :) , would you really want any updater to be fully automatic? I have in mind, for example, the frequent Microsoft updates that break applications and even Windows itself. And, last month or so, even Adobe published an update that broke several of its Cloud-based applications. Isn’t it better to invest (I guess some might say, “waste”) the time in knowing EXACTLY what is being done to your computer?